High-quality furnishings are an expression of personality and a visual representation of a company’s philosophy. 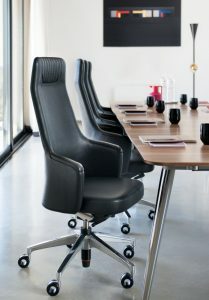 ‘Modern classics’ are commonplace in prestigious executive floors, conference rooms, and customer areas. Elegant and exclusive as they may appear, these furnishings are not necessarily comfortable to sit on for longer periods of time. Deeply committed to healthy ergonomics in work environments, Sedus has taken a different approach. The Modern Classics edition provides furnishings that exude quality beneath the surface, too. With aesthetic appeal and obvious sophistication, the resulting workspaces offer perfectly aligned ergonomics for business premises and home offices alike. The open up and silent rush swivel chairs raise premium seating to a whole new level. Fitted with the patented Similar mechanism, both models offer outstanding comfort. Carefully selected materials, including aniline leather tanned with olive leaves, are representative of the high-quality workmanship found in this special edition. The upholstery is lovingly handcrafted and is a fine example of German quality in perhaps its most impressive form. Both models come into their own when combined with the Sedus attention desk. The solid wood panels found in the barrel oak and steamed walnut variants are cut from sturdy tree trunks. Each panel is a unique reflection of the tree’s individual growth pattern. A genuinely beautiful one-of-a-kind. Every location used to welcome guests and business partners needs its own Sedus on spot vero. This exclusive lounge chair gives the right first impression to every visitor. The seat shell is wrapped in fine leather, while subtle details such as the contrasting colour seams and upholstered edges add attractive accents.